Today we will take a look at the series of discoveries and innovations that led to the development of insulin therapy for type 1 diabetes, and tomorrow we will take a closer look at some of that claims made about this by animal rights activists. With the World Diabetes Day coming up on 14th November, it is no surprise that activists are targeting diabetics by saying that cures and supportive treatment of this disease owe nothing to research on animals. They as usual, support their claim by a series of misinformation, statements taken out of context and in some arguments, deliberate distortions. Although the remedy for diabetes was discovered in the 20th century, it is a disease that has plagued mankind since the ancient times. It was first described some 3,500 years ago by Egyptian physicians. Since then, various physicians of different civilizations – Greek, Roman, Indian, Chinese, Japanese and Arabic – have separately recorded descriptions of this disease, with the Greeks giving it the name ‘diabetes’ in reference to the increased frequency of urination that is characteristic of it. The predominant school of thought at that time was that the disease was due to kidney malfunction. From the 16th to 18th century, diabetes was further described by European doctors, and from the idea that the disease was caused by kidney malfunction, various other hypotheses were also put forward – liver malfunction, systemic disease or even a malfunction of the central nervous system. Amongst the various hypotheses put forward, one from Dr Thomas Cawley in the late 1700’s, linking diabetes to a damaged pancreas, based on the autopsy of a diabetic patient. During the 19th century evidence for a role of the pancreas in diabetes increased, but it was not clear if the damage seen was related to the cause of the disease or was a consequence of the disease, and how the pancreas might be regulating blood sugar. The pancreas was known to secrete digestive enzymes into the intestines via the pancreatic duct, but it was not clear how this function was related to the proposed role in controlling blood sugar levels. The first experimental proof that the pancreas played an important role in carbohydrate metabolism and that diabetes could be of pancreatic origin was provided in 1890 by Von Merin and Minkowski using dogs as research models. Their work showed that if the pancreas was removed from a dog, the animal got diabetes, but if the duct through which the pancreatic juices flow to the intestine was ligated the dog developed minor digestive problems but no diabetes, indicating that the roles of the pancreas in digestion and regulating blood sugar were separate (1). Later Minkowski and French scientist Edouard Hedon showed independently that if the entire pancreas was removed but some pancreatic tissue was grafted under the dog’s skin then diabetes was prevented, thus conclusively demonstrating that the sugar regulating function of the pancreas was independent from its role in digestion (2). While the role of acinar cells of the pancreas in the production of digestive juices was well understood at that time, the small clusters of cells (‘islets’) discovered by Paul Langerhans in the pancreas of rabbits in 1869 still had no function attributed to them. Dr Edouard Laguesse in 1893 suggested that these ‘islets of Langerhans’ might constitute the endocrine tissue of the pancreas responsible for the glucoregulatory role of this organ. Further evidence for this role came in 1900 from the pathologist Eugene Lindsay Opie, who noted damage to the islets of langerhans in diabetes patients (4). A year later Leonid W. Ssobolew demonstrated that a ligature of the pancreatic ducts in rabbits, cats, and dogs leads to gradual atrophy and destruction of the enzyme-secreting acinar cells, whereas the islet cells remained intact for weeks, with no evidence of excessive sugar in the urine (5). In 1905, William Bayliss and Ernest Henry Starling, introduced the concept of hormones to designate the chemical messengers of the body’s endocrine glands, following their identification of the first hormone “secretin” through research on the regulation of digestion in dogs (3). Extrapolating on this concept, in 1913, Sir Edward Albert Sharpey-Schafer – another pioneer in the field of endocrinology – suggested that a hormone responsible for lowering blood sugar concentration was being secreted by the islets of Langerhans and he named this hypothetical hormone ‘insulin’. Independently, 4 years earlier, Jean de Meyer, a Belgian physician had produced an extract from the pancreas that lowered blood sugar concentrations and he also, concluded that the extract contained a substance from the islets of Langerhans and he named that hypothetical substance ‘insuline’ (Latin: insula,island). Once it was clearly established that there was a link between diabetes and the pancreas – more specifically, a substance produced by the islets of Langerhans – researchers from various parts of the world were focusing on treating diabetes with pancreatic extracts. Several workers including Zuelzer (Germany), Paulesco (Romania), Scott and Kleiner (North America) had all been able to produce pancreatic extracts that often reduced hyperglycemia or glycosuria in animals and, in a handful of cases with mixed results, in humans. However, due to toxic reactions after the initial relief of symptoms and the outbreak of the First World War, their work was discontinued or slowed down. The problem of how to isolate the hormone insulin in a form sufficiently pure for clinical use remained for now unresolved. 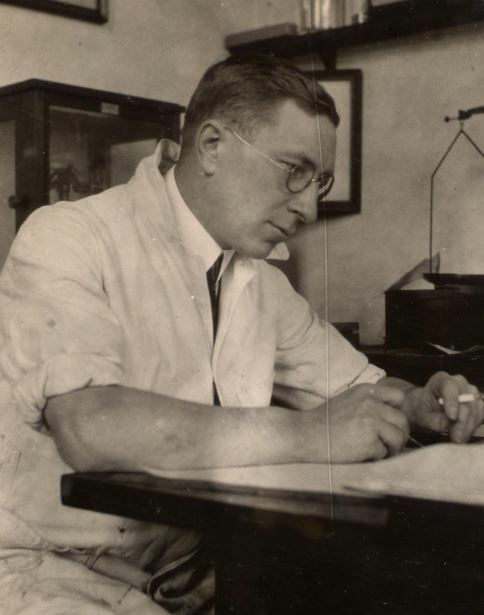 On 30 October 1920, while preparing for a physiology lecture, Frederick Banting came across the article by Moses Barron, “The Relation of the Islets of Langerhans to Diabetes, with special reference to cases of pancreatic lithiasis” (6). While doing routine autopsies, Dr Barron had come across a rare case of the formation of a pancreatic stone. Rarer still, the stone had completely obstructed the main pancreatic duct. Dr Barron observed that this obstruction had caused the atrophy of all acinar cells while the islets of Langerhans had remained intact, and he observed that there was a similarity to Leonid W. Ssobolew’s earlier animal studies where the ligature of the pancreatic ducts in rabbits, cats and dogs lead to the gradual atrophy of the enzyme-secreting acinar cells. Although not a researcher (he was a general surgeon and part time lecturer), Banting’s thoughts were triggered by Dr Barron’s article, as he describes in his 1923 Nobel Prize Lecture. He suspected that in the failed attempts of those scientists who were using pancreatic extract to cure diabetes, the digestive enzymes of the pancreas were destroying the active principle responsible for lowering glucose levels. He started thinking about what if the extract came from a fully degenerated pancreas (through duct ligation) – something that no one had tried before. He brought his idea to John Macleod, department head at the University of Toronto and a leading authority on carbohydrate metabolism. After much convincing, Macleod agreed to provide research facilities including 10 dogs as research animals and overview the testing of Banting’s proposal. He employed Charles Best to be a research assistant to Banting with work starting in May 1921 (7). The team had to first refine their surgical techniques on dogs – namely to ligate the pancreatic duct in some animals, and in other individuals to completely remove the pancreas. On 30 July, they managed to obtain an extract from a duct-tied dog which was administered to a depancreatised dog that was displaying the symptoms of diabetes. The extract caused a reduction in blood sugar. The experiments were replicated and recorded frequent decreases in blood sugar as well as sugar excreted in urine. The team had experimental evidence of having isolated an extract with antidiabetic properties – they named the extract ‘Isletin’. They next refined their technique by using a hormone, secretin, to exhaust acinar cells and obtain extracts from the pancreas free from digestive enzyme trypsin, thus bypassing the duct ligation procedure. They also explored the avenue of obtaining pancreatic extract from fetal calves – in which there was no active acinar secretion, hence free from the digestive enzymes. This was successful but still not efficient enough to be appropriate for large scale production. The next advance was to employ an extraction method that used slightly acidified alcohol rather than saline water, as the ethanol could then be evaporated to leave behind the active hormone. With the help of James Collip, a biochemist who joined the team in early December 1921, they managed to secure the active principle from fresh whole beef pancreas, and Collip even managed to isolate the active principle as a powder, still with impurities but far purer than any previous extracts. This was tested on rabbits as newer methods for blood testing had been developed that required a far lesser volume of blood as sample. These new methods for testing blood sugar levels had been instrumental in the further purification and testing of the extract as it was more precise, more rapid and required a small volume of blood (hence, smaller animals could be used). After the assay of tests, it was realized that the extract was sufficiently pure for testing on humans. On 11 January 1922, the extract was administered to Leonard Thompson, a 14 yr old boy with severe diabetes, however, although they recorded a drop in blood sugar levels, it was considered not effective enough. A second trial on 23 January 1922 with a more highly purified extract prepared by Collip was performed, and this time a more significant blood sugar level decrease as well as glucose excretion level decrease was obtained. In February 1922, 6 more patients were treated, all with favourable results (8). In later papers the active principle was re-named ‘Insulin’. When moved to industrial production, with the help of the chief chemist from Eli Lilly and Co, Georges Walden, insulin was being produced at greater yields, better stability and much purer than what was obtained before. Diabetic patients were being treated successfully and the team was achieving fame, honours and prizes with the culmination of the Nobel Prize being awarded to Banting and Macleod in October 1923. Further work by other scientist on Insulin resulted in its sequencing by Frederick Sanger in 1958. Chemical synthesis of the two protein chains of insulin was achieved in 1967. For many years, beef/pork insulin was the only source of insulin until 1974 where Sieber and his colleagues managed to chemically synthesise human insulin. Subsequently human insulin was produced by recombinant DNA technology by scientists working for the biotechnology company Genentech Inc. and in 1982 the first synthetic insulin analog “Humulin” was approved by the FDA. Nowadays more than 300 insulin analogues exist – with differences in their absorption and duration of action characteristics according to the needs of the patients. Prior to the introduction of insulin therapy, most patients with diabetes died within a year of diagnosis. Today’s life expectancy for people with diabetes is still lower than that for the general population by about 10 years, but better control is leading to longer and healthier life. Much of this improvement is thanks to animal testing. Tomorrow, in the second part of this article, we will take a closer look at some of the specific claims that animal rights activists are making about the role of animal research in the development of insulin therapy for type 1 diabetes. 2) Hedon E. “sur la consommation du sucre chez la chien apres l’extirpation du pancreas” Arch Physiol Narmal Pathol Vth series 1893; 5: 154-63. 3) Bayliss WM, Starling EH.”The mechanism of pancreatic secretion.” J Physiol. 1902 Sep 12;28(5):325-53. 5) Ssobolew LW. “Zur normalen und pathologischen Morphologie der inneren Secretion der Bauchspeicheldrüse.” Archiv für pathologische und anatomie und physiologie und für klinische medizin 1902;168:91-128. 6) Barron M. “The relation of the islets of Langerhans to diabetes with special reference to cases of pancreatic lithiasis.” Surg Gynec Obstet 1920;31:437-448. 8) Banting FG, Best CH, Collip JB, Campbell WR, Fletcher AA. “Pancreatic Extracts in the Treatment of Diabetes Mellitus.” Can Med Assoc J. 1922 Mar;12(3):141-6. Posted on November 12, 2013 November 14, 2014 by EditorPosted in News, Science NewsTagged animal testing, banting and macleod, history of insulin, insulin, World diabetes day. What a good thing it was that the animal rights movement was not able to curtail the development of the knowledge that is described in this history of discovery of insulin.